An ‪#‎openmiracle‬ happened to me on Wednesday morning on my way to work. The night before was a huge snowstorm that covered much of the GTA (Greater Toronto Area). The following morning the highways were cleared on my way to work. What I didn’t realize until it was too late was that the exits and side roads weren’t. At any rate, I was about to get off the exit of Martin Grove Road via Islington Avenue, five minutes away from the office, when my car skidded out of control. It first went the opposite direction into traffic on the left lane. I then turned my steering wheel the opposite way. What was going through my mind at the time was, should an accident occur, I didn’t want to get other people involved so that it should occur at the exit, otherwise it might have ended very badly. The car then skidded the opposite direction into the exit, headed toward the oncoming wall. 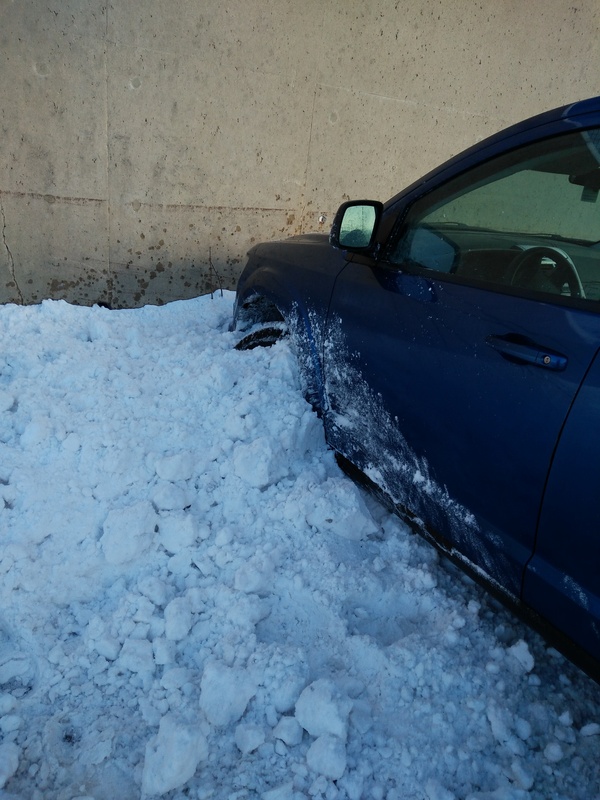 I was certain that either I wouldn’t have gotten out in one piece (CH”VSh), or I would have but the car would have been damaged. As I was very near the wall I was expecting to see air bags come out. 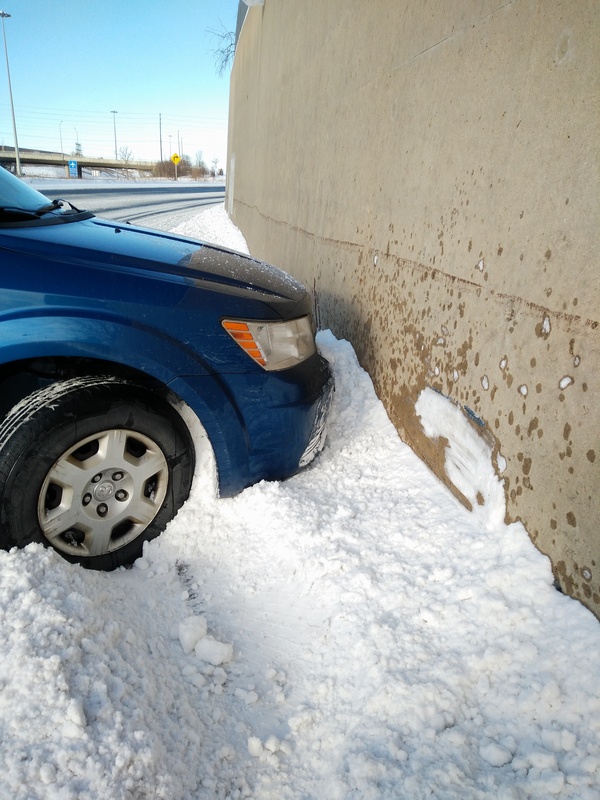 Amazingly, the snow bank which formed very night before (making it fresh and soft) broke the impact. 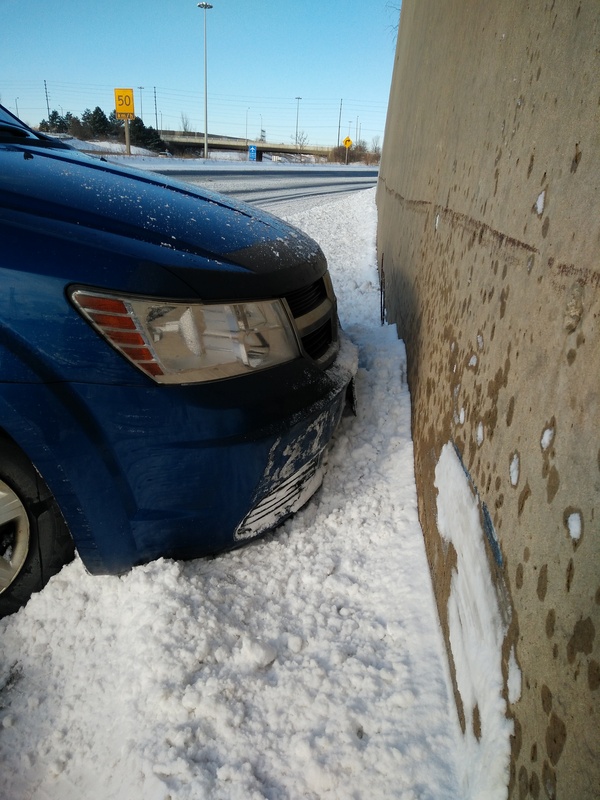 What’s more amazing is that the car is fine as the car literally missed the wall by three inches (see pictures). As the car reached a stop, I was curious why the car didn’t crash, then stepped outside to investigate and take pictures. I called my wife to let her know what happened, and anticipated not being able to come into work. Other cars were still passing by when a very nice South African lady asked if I needed help. 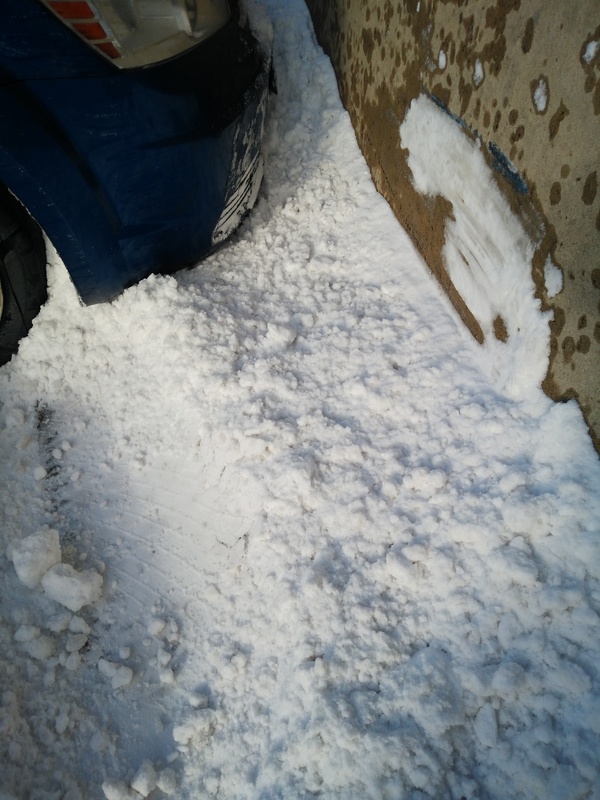 I replied something to the effect of “about as much as I can get now.” She then stopped four people to help, one of whom is a co-worker who offered to bring a snow shovel from the office (which I said was a very good idea since I had no snow shovel or brush). As she was talking to me, three other people helped. 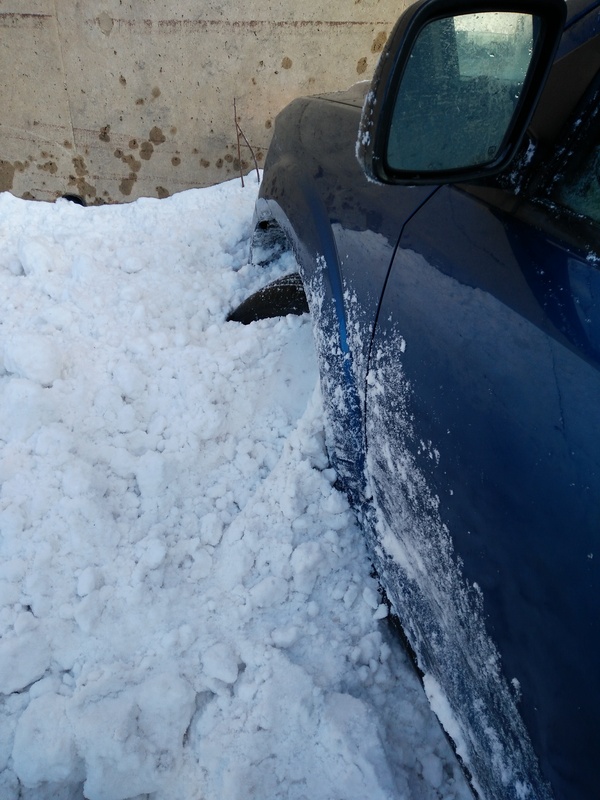 Two were using a snow brush to dig my car out of the snow and one other person was behind the wheel getting my car out of the bank. All were amazed at how I and the car both emerged unscathed, and I was able to still arrive at work, albeit late. In short, it was a very scary experience. At the moment I was telling people that if they wanted to see a clear miracle, here it was. Thankfully everything proceeded as usual from that moment on, though I started sharing the story with a bunch of others. The following morning I bentched Gomel in Shul (literally, thanking Gd for bestowing a favor to me in saving my life). The Rabbi asked me if I made a trip somewhere (since most that bentch Gomel fly to/from Israel since overseas can be dangerous) and I replied, “not exactly.” I then proceeded with the story above and showed him the pictures below. Angels aren’t what we perceive in our collective consciousness, wearing wings and fly in the air, etc. Angels are anyone/anything that save us. The angels included here are the wonderful people that assisted and the snow bank (hence “snow angels”). 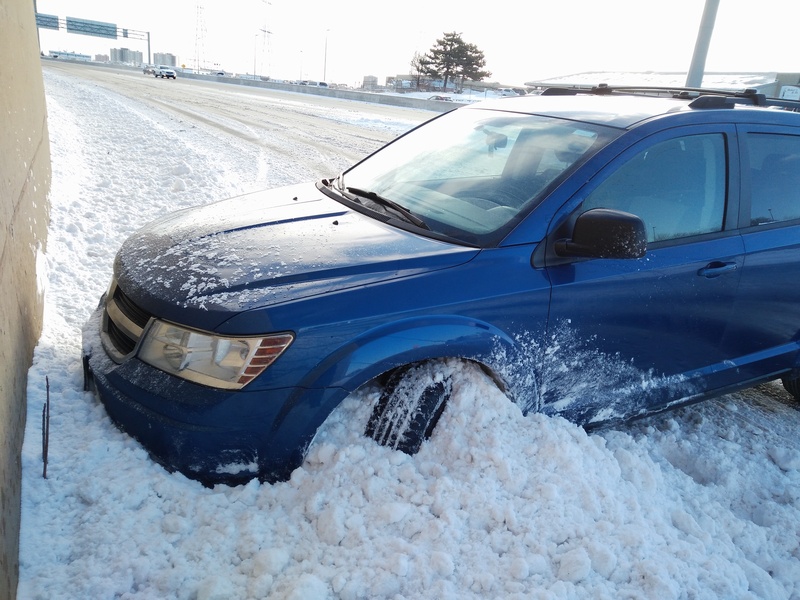 For next Winter (since now it’s too late) it behooves me to invest in snow tires in the car I/my wife will drive. I really need to take Winter driving lessons on skidding. My driving instructor in New York didn’t teach that and I learned it in theory when going for the Learners Permit (the equivalent to the G1 Licence in Canada). I’m aware that you are supposed to “go into the groove” but at the moment I wasn’t sure how to do so.